A non-surgical brow lift uses an injectable neuromodulators, such as Botox® to lift the eyebrows. Botox® is a non-invasive treatment that temporarily relaxes the muscles around the eye that pull the eyebrows down. As a result, the eyebrow is lifted and the eyes look bigger and more open. Also the hooding or extra skin over the corner of the upper eyelid may be mildly reduced as well. The effects of Botox® usually last 3 months, although some people have longer lasting results. Botox® needs to be injected in the right location with the right dose for the best and most natural looking results. 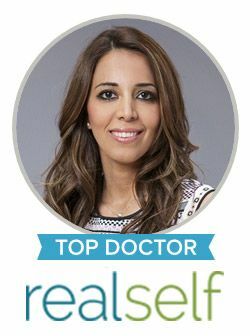 Am I a Candidate for a Non-Surgical Eyebrow Lift? A non-surgical brow lift is best for people with mild brow ptosis. It most effectively improves lateral brow ptosis, which is the outer ½ of the eyebrow. The best candidates for a non-surgical brow lift have mild eyebrow descent and do not want surgery. You can achieve great results with a nonsurgical brow lift in the right patient. Contact our office today to schedule your consultation with Dr. Harirchian. In the above patient, Dr Harirchian used Botox® to eliminate the wrinkles of the crow’s feet, and to lift the eyelid & eyebrow. There is less extra skin on the corner of eye and the eyebrow is lifted, all without surgery!